Dont forget to replace your icemaker if has stopped working to be sure to keep your ice bin full! 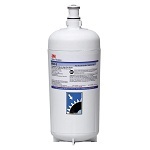 The 3M Aqua-Pure HF45-S (5613309) is a replacement water filter cartridge for the 3M Aqua-Pure ICE145-S Icemaker Filter System. It reduces the bad taste and odor of chlorine as well as sediment, dirt, rust, scale, and other impurities.